Strata Worldwide and RFI Technology Solutions have joined forces to bring the underground world a simple yet powerful solution for overcoming many of the classic constraints of typical digital networks. It assists in resolving the common “last mile” difficulties of getting power and connectivity to the working section, it solves the issue of limited availability and fixed locations of underground power stations, it breaks the boundaries set by pre-existing network cables that dictate the placement of end-point devices, and it streamlines the labour of cable installation and maintenance – all by combining power and high-speed data into a single, simple to use coaxial cable. With data speeds comparable to fibre optics, Strata Worldwide’s DigitalBRIDGE™ is an ideal solution to bridge[Office1] [PG2] power and data to the edges of your mine. StrataConnect DigitalBRIDGE is a multi-drop Power-over-Ethernet (PoE) coaxial cable network that is easy to install, involves very low maintenance and is highly user friendly. The simplicity of coaxial cable eliminates the need for specialised, outsourced electricians and enables operations to utilise on-site personnel for installation, expansion, recovery and maintenance; thus overall cost of ownership is significantly reduced. Coaxial cable is inherently easy to use; it can be cut and spliced at any point and at any length, providing complete flexibility in network architecture and system engineering. Power can be inserted at any point along the cable, enabling operations to utilise power stations wherever they are. Once connected, the 24 to 60 volts of DC power will flow in both directions, powering components and end-point devices anywhere along the cable. High-speed data will travel over 2,000 meters (6,000 feet) without a repeater. After the inclusion of a repeater, cable lengths can extend over another 2,000 metres before the next repeater is recommended. This point-to-multipoint network can be used as a standalone system for underground connectivity or can be used to expand and/or break off from pre-existing fibre optics. Mines can use DigitalBRIDGE for Voice-over-Internet Protocol (VoIP) communications, high-speed digital data and real-time telemetry, and it is ideal for establishing powered connectivity in remote and abandoned areas that still require monitoring. DigitalBRIDGE’s capabilities and functionalities are highly versatile and fully customisable. Examples of current applications include a central African copper mine utilising DigitalBRIDGE technology to operate digital cameras, Wi-Fi access points and tracking readers in production areas of the mine. The cameras enable surface operators to visually monitor areas, measure productivity, understand potential bottlenecks and identify the root causes of incidents. In its selection criteria, the mine required adequate bandwidth to support a large number of digital cameras in real time, operating simultaneously with Wi-Fi and tracking, while having the flexibility to quickly deploy and move cameras into different locations as required. 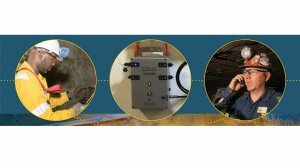 In a second African mine, DigitalBRIDGE technology is being used to remotely monitor the mine’s emergency refuge chambers to ensure appropriate use of the units, and that they remain operationally ready in the event of an emergency. By using this technology, the mine’s permanent and portable emergency chambers include video surveillance, telephony, RFID tracking, Wi-Fi access and remote atmospheric monitoring. In making its selection, it was important to the mine to be able to disconnect the portable chambers and easily reconnect them once in their new locations. Finally, an underground nickel mine in Western Australia has deployed the DigitalBRIDGE platform to remotely operate its underground loaders from the surface. Since the loaders work across ore drives on multiple levels, it was difficult and expensive to connect all levels to the surface using fibre. This forced the suspension of loading operations during shift changes, losing hours of production. To resolve the issue, DigitalBRIDGE technology was chosen by the mine for its significant comparative cost savings and ease of installation. The technology’s native Ethernet capabilities also allowed Wi-Fi access points and digital cameras to be added. This technology will be on display at Electra Mining, Hall 5, Stand F17. Please stop by to learn more!